The Samsung Captivate Glide for AT&T starts off with the basics – quad-band GSM/GPRS/EDGE and tri-band 3G. There’s HSPA+ with 21Mbps downlink and 5.76Mbps uplink too, which some carriers brand as “4G” even though it’s technically not. The Wi-Fi support includes a/b/g/n versions. 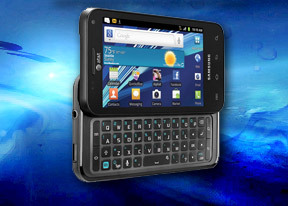 While the interface of the Android web browser has hardly changed, the hardware specs of the Samsung Captivate Glide for AT&T allow great user experience. The sharp display with great colors makes reading a joy. Hubs are not just for Windows Phone 7 – Samsung, at least, seems to think so. They’ve added two Hubs to their QWERTY offering. The Samsung Captivate Glide comes with Quickoffice preinstalled. It’s one of the most feature rich mobile editors we’ve seen. You can view and edit Word, Excel and PowerPoint documents and there’s a PDF viewer to boot. With a full-blown hardware QWERTY on board, one can get seriously productive with the office editor of the device. The Samsung Captivate Glide features a decent alarm clock application which allows a huge number of alarms to be set, each with its own start time and repeat pattern.